You are here: Home / Healthy Living / As Bad as Glyphosate? 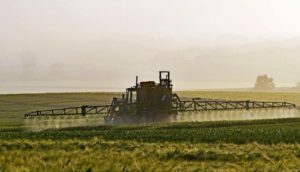 Every fifteen years, the Environmental Protection Agency (EPA) is required to assess new pesticides and herbicides that are approved for use in the U.S. An analysis of the second most widely used chemical in U.S. agriculture was just released in June. The chemical Atrazine is used to fight weeds and increase yields primarily on corn, sorghum and sugarcane in the Midwest. According to a report by the EPA, atrazine exceeds the agency’s “levels of concern” for chronic risks to animals and fish by 198 times and 62 times, respectively. As much as 70 million pounds of the chemical are used by farmers each year. Atrazine is chlorine based, can last in the soil for up to 20 years, and leaves behind a troubling amount of residue. Atrazine does not typically kill animals outright, but has been shown to adversely affect their developmental, hormonal, and reproductive systems. The EPA found that atrazine runoff and spray drift also reduces land-based plant biodiversity. The EPA is expected to release its assessment of atrazine’s impact on human health later this year.